Only two think tanks received highest marks for transparency this year, the Center for Global Development and the World Resources Institute. Two members of the Data Lab, Dan Hammer and Robin Kraft, have worked at both. So ... infer away. Actually don't. This is an awesome article that illustrates why correlation does not imply causation. 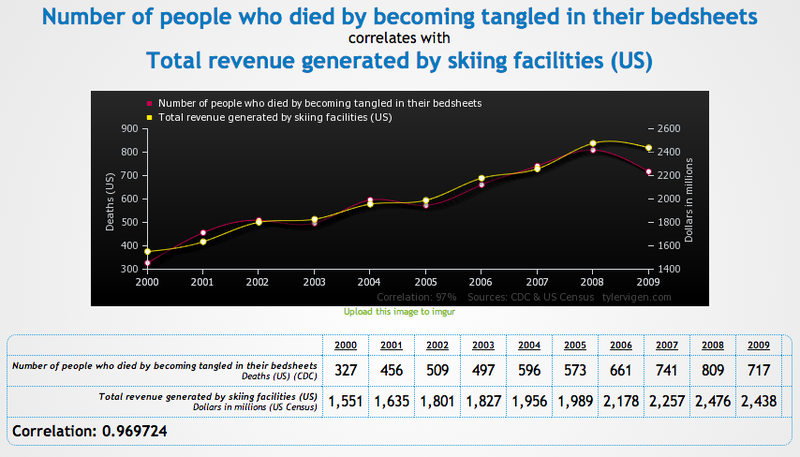 There is, for example, near perfect correlation between the number of people who died from bedsheet entanglement and total revenue generated by ski facilities. Technically, the two time series are cointegrated,sharing a common stochastic drift. Intuitively, just because two measures are correlated does not mean that one causes the other. So, just because Robin and Dan worked at both institutions does not mean they had anything to do with the transparency rating. But that doesn't mean that they won't take credit.